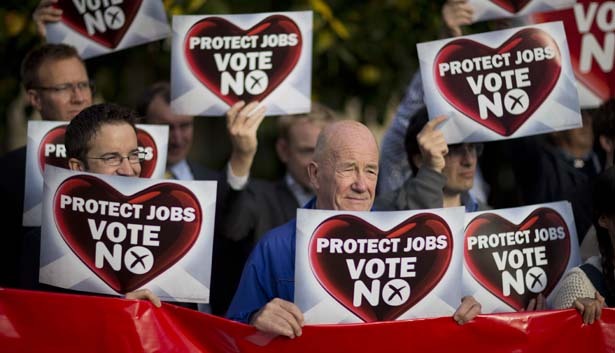 Did the UK Media Push Scotland’s ‘No’ Vote? Scotland was closely divided on the issue of independence. But media cast a loud “no” vote. Edinburgh, Scotland—Five days before the Scottish independence referendum, one of the larger demonstrations of a long and intense campaign was held in Glasgow. It wasn’t a rally for a “yes” or a “no” vote. It was a protest outside the Scottish headquarters of the BBC. Thousands of independence supporters showed up to object to the coverage of the campaign by the broadcaster in particular, and media in general. Salmond’s “yes” side ultimately lost, as Scots decided Thursday by a convincing 400,000-vote margin to remain a part of the United Kingdom. Major media outlets remain powerful forces in our democratic life. They are not always definitional—as any newspaper editorial writer will tell you—and it is important to recognize that in Scotland and beyond a great many factors influence election results. Still, there are those moments that illustrate the extent to which major media outlets tend to echo one another rather than the range of popular debate. That has been evident in the United States on a number of high-stakes issues in recent decades. When the US was weighing whether to approve the North American Free Trade Agreement in 1993, polls suggested that the country was deeply divided, and the House split 234-200. Yet the chattering classes were overwhelmingly pro-NAFTA, and newspaper editorial pages were very nearly universal in their support for the controversial pact. It wasn’t just the editorial pages; an analysis by Fairness and Accuracy in Reporting found that pro-NAFTA sources highlighted by major media outnumbered opponents by more than 3-to-1. When matters of war and peace are in play, as was the case before the invasion of Iraq in 2003, FAIR has found even more overwhelming patterns of media turning up the volume on pro-war voices while dismissing those urging caution. In Scotland, on the morning after Thursday’s vote, discussions of the media coverage became an important part of the overall analysis of the result. The BBC rejected complaints that it hyped claims about economic challenges that might be faced by an independent Scotland. And, notably, the broadcaster covered what Stiglitz had to say. Yet there was no debating the imbalance in the positions taken by the newspapers that circulate in Scotland. Scottish-based daily newspapers, which are widely read and influential, were overwhelmingly opposed to independence—with just one major newspaper, the Sunday Herald, urging a “yes” vote. The British national dailies, which circulate widely in Scotland, were even more determined in their opposition—offering up intense criticism of the idea of independence and of independence campaigners. That was especially true after a key poll published almost two weeks before the vote suggested that the “yes” side had moved into a narrow lead. Jim Sillars, a former deputy leader of the Scottish National Party and an outspoken independence campaigner, said the numbers “rattled the cages” of economic and political elites in London. It was at that point that the papers turned up the “no” volume. There will be books written on the overall character and the content of the coverage. But what was most striking was the stances taken by the newspaper editorial pages of the Scottish papers. No one expected them to be universal in their support for independence. But their opposition was exceptional. Monbiot could have removed the words “in Britain” and been just as accurate in his observation.